Program management has become an essential skill for modern businesses. Managing Successful Programmes (MSP) is a highly-regarded program management framework used by managers in different industries the world over. Study for your MSP certification online with Good e-Learning today! What Is Managing Successful Programmes (MSP)? In the modern world of business, the ability to efficiently drive major organizational change has become essential. Companies the world over place enormous value on the skills required to steer program management teams towards achieving large and complex business objectives. Unfortunately, with so much riding on the success of change management, it is extremely risky to expect those in program and project manager roles to reach this level of competence with experience alone. Managing Successful Programmes (MSP) is, as the name suggests, a program management methodology. While it may sound boastful, the name is anything but unfounded; MSP has been applied across numerous industries all over the world, creating a community of practitioners who can all back up just how ‘successful’ it is. In essence, MSP breaks down programs into individual projects, each with clearly defined lines of communication, roles, responsibilities, benefits and so on. Together, these programs offer greater strategic benefits than the sum of their projects. Better yet, the framework can be applied regardless of an organization’s location, size, industry or sector. So, what exactly is it that makes MSP so ‘successful’? How does it work, and what is the value of an MSP certification? When it comes to achieving crucial organizational objectives, having a vague idea of what you want to achieve isn’t even enough to get started! Those in program management roles must be capable of clarifying their intentions, as well as the costs and benefits of pursuing the objectives, not just at the start of a program but throughout. Then come the matters of creating a roadmap for reaching the intended destination, designating authority to project managers, engaging with stakeholders, and so on. All of this can quickly mount up to a hugely complex process. In a multinational organization, or even in a startup, attempting to bring about major changes without a clear process in place is highly inefficient. So, how can you progress with optimum efficiency and clarity? How can you ensure that you maximize the benefits of a program without overspending or delaying completion dates? MSP offers a best practice methodology for planning, instigating, managing and concluding successful programs. It breaks them down into multiple projects, each with clear roles, objectives and benefits. While the framework is comprehensive, it remains flexible enough not only to be applied to programs of different sizes, sectors and locations, but also to be adapted in order to reflect unique program requirements. To fully understand how MSP works, you must become familiar with its Governance Themes, Principles and Transformational Flow Processes. How can an MSP Certification Help my Business? Program management has become an essential skill for driving transformational change in organizations. With a clear process in place, businesses can realize the benefits of these changes as quickly and efficiently as possible without having to sacrifice quality or disappoint stakeholders. The MSP framework offers a proven roadmap for bringing about organizational change. It helps practitioners to expertly define and pursue changes, managing risks, unforeseen issues, stakeholders and other aspects with complete clarity and control. The comprehensive yet flexible approach has seen it applied to programs across dozens of industries and tens of thousands of companies, with MSP Foundation and Practitioner certifications having become highly valuable. If you are not utilizing an effective program management framework, you may be in the minority! 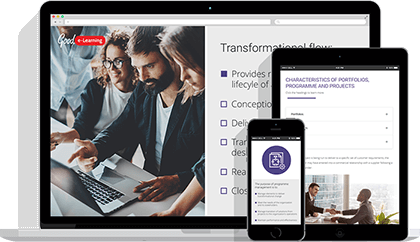 Good e-Learning is an award-winning online training provider which covers the world’s most popular corporate standards and frameworks, including Managing Successful Programmes, Agile, DevOps, Lean and TOGAF. Each of our courses is put together by our in-house team of experts, not only allowing us to offer courses at excellent prices but ensuring that students always have access to expert advice. Best of all, our courses can be accessed via multiple devices. Whether you are traveling, killing time or just sat at your desk, you can continue your studies whenever it is convenient for you.